In my corner of the world, summer is short! Hot, sunny days are for swimming, reading in the hammock, and playing in the garden. Even with as much as I love to cook, now is not the time for spending hours in the kitchen! Three Ingredient Shrimp Soup will have you back outside in five minutes flat. That’s right, this savory, cold soup takes mere minutes to prepare, and makes an excellent lunch. Or, add a loaf of French bread and call it dinner. Step 1) Puree salsa and cucumber together. So simple! Chill well. 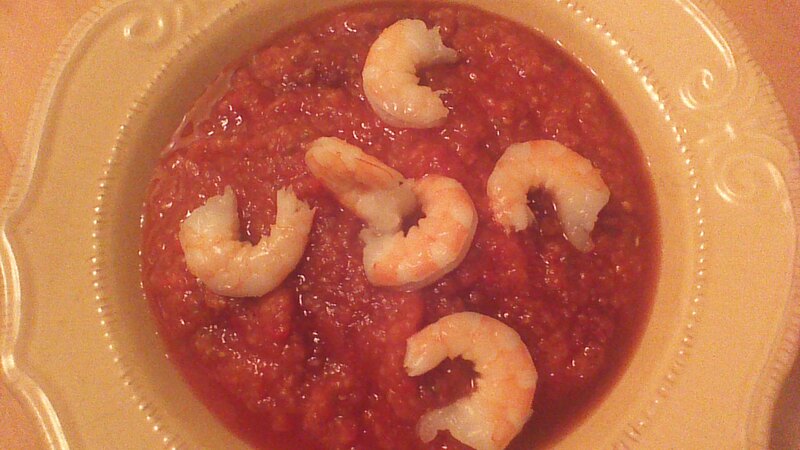 Step 2) Ladle chilled soup into bowls and top with a generous serving of chilled, cooked shrimp. Delicious! This entry was posted in Soups and Salads, summer and tagged Cooking, Food, Gluten Free, health, low-fat, Paleo, recipe, Shrimp, soup, summer, wellness. Bookmark the permalink. I could live on this soup. And as a Weight Watcher’s member, it is a low point dream come true! Thanks for posting.